Picture - 1783: First flight at Annonay. The kite is popular during the century. Father Bartolomeu de Gusmx�o designs a model hot air balloon and demonstrates it to King John V of Portugal. Well thought-out glider-project of the Swedish scholar Emanuel Swedenborg. Basis for his construction are bird flight and the glider kite. Picture - 1783: First manned voyage at Paris. In his Hydrodynamica the Swiss scholar Daniel Bernoulli (1700-1782) formulates the principle of the conservation of energy for fluids (Bernoulli's principle), the relationship between pressure and velocity in a flow. English military engineer Benjamin Robins (1707-1751) invented a whirling arm centrifuge to determine drag. 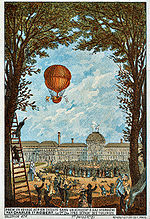 Picture - 1783: First gas balloon flight. British chemist Henry Cavendish determines the specific weight of hydrogen gas. Abb� Desforges unsuccessfully tries to fly an apparatus with a basket and oars made of bird feathers. 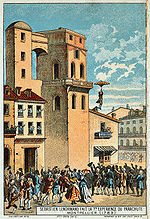 In St.Louis, the prisoner Dominikus Dufort jumps from a high building with a parachute garment and is rewarded with a spontaneous collection of money. 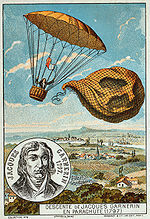 Picture - 1783: Sebastian Lenormand performs a parachute jump. Italian scientist Tiberiua Cavallo, then living in England, sends up soap bubbles filled with oxygen. June 5, unmanned flight of the Montgolfier brothers hot-air-balloon (Montgolfix�re) in Vivarais, France. The Montgolfiers demonstrate a hot air balloon in public, at Annonay. Picture - 1785: First crossing of the Channel. August 27, flight of Le Globe, an unmanned experimental hydrogen-balloon, in Paris (built by Professor Charles and the Robert brothers). It flies 25 km (15 miles) from Paris to Gonesse and is destroyed by frightened peasants. September 19, the Montgolfiers launch a sheep, duck, and rooster in a hot-air balloon in a demonstration for King Louis XVI of France. The balloon rises some 500 m (1,700 ft) and returns the animals unharmed to the ground. 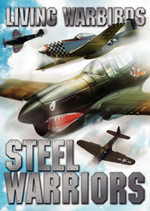 October 15, Pilx�tre de Rozier and Marquis d'Arlandes rise into the air in a Montgolfix�re tethered to the ground in Paris. 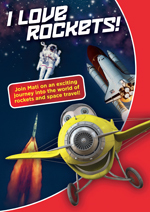 de Rozier becomes the first human passenger in a hot-air balloon, rising 26 m (84 ft). November 21, in a flight lasting 25 minutes, de Rozier and d'Arlandes take the first untethered ride in a Montgolfix�re in Paris, the first human passengers carried in free flight by a hot-air balloon. 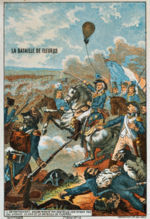 Picture - 1794: First use in battle. 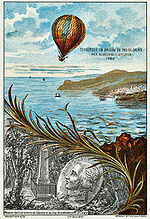 December 1, Jacques Charles and his assistant Nicolas-Louis Robert make the first flight in a hydrogen-filled balloon (La Charlix�re). They travel from Paris to Nesles-la-Vall�e, a distance of 43 km (27 miles). On his second flight the same day, Charles reached an altitude of circa 3,000 m over Nesles-la-Vall�e. Sebastian Lenormand does several parachute jumps from the tower of the observatory in Montpellier. September 19, Anne-Jean Robert, Nicolas-Louis Robert and Colin Hullin fly La Carolina, a hydrogen balloon, 186 km from Paris to Beuvry. 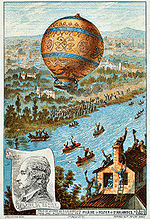 Jean-Pierre Blanchard fits a hand-powered propeller to a balloon, the first recorded means of propulsion carried aloft. Pilx�tre de Rozier and the chemist Proust rise with a Montgolfix�re up to 4,000 m.
Jean Baptiste Meusnier makes an oblong balloon to explore unknown areas, with an airscrew driven by muscle power. Picture - 1797: First high-altitude parachute jump from a balloon. June 15, Pilx�tre de Rozier and Pierre Jules Romain become the first known aeronautical fatalities when their balloon crashes during an attempt to cross the English Channel. 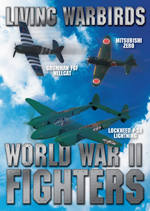 July 1, Jean-Pierre Blanchard and the American meteorologist John Jeffries cross the English Channel from Dover to Gux�nes in a balloon. Richard Crosbie makes several unsuccessful attempts to cross the Irish Sea in a hydrogen-filled balloon. Ukita Kōkichi, Japanese paperhanger, makes artificial wings and tries flying from the top of a bridge. Military use of a captive balloon at the siege of Mainz (Germany). Jean-Pierre Blanchard makes the first balloon ascent in the United States. 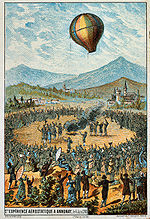 April 2, establishment of the Company of Aeronauts, the first airship company in the French Army, who use a balloon named l'Entreprenant for reconnaissance of the Austrian forces at the Battle of Fleurus. Two companies of balloon observers are formed. October 22, Andr�-Jacques Garnerin jumps from a balloon from 3,200 feet over Parc Monceau in Paris in a 23-foot-diameter parachute made of white canvas with a basket attached. He was declared "official French aeronaut of the state". At least one balloon of the French army's Company of Aeronauts is transported aboard the French Navy warship Le Patriote for use ashore in conducting a reconnaissance of the coast of Egypt, but Le Patriote strikes a rock and sinks off Alexandria, Egypt, on July 4. August 1 - The French ship-of-the-line Orient has gear of the French Army's Company of Aeronauts on board when she is destroyed during the Battle of the Nile. Englishman Sir George Cayley (1773-1857) sketched a glider with a rudder unit and an elevator unit. 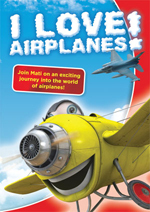 His manuscript is considered to be the starting point of the scientific research on heavier than air flying machines. It was Cayley who helped to sort out the confusion of that time. …"He knew more than any of his predecessors … and successors up to the end of the 19th century." - Orville Wright. Even so his ideas did not affect further development very much. January 15 - The French Army's Company of Aeronauts is abolished.